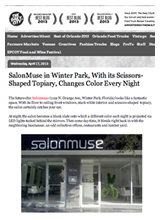 SalonMuse in Winter Park, With its Scissors-Shaped Topiary, Changes Color Every Night : The future-chic Salonmuse (1192 N. Orange Ave., Winter Park, Florida) looks like a fantastic space. With its floor to ceiling front windows, stark white interior and scissors-shaped topiary, the salon certainly catches your eye. At night, the salon becomes a blank slate onto which a different color each night is projected via LED lights tucked behind the mirrors. Then come day time, it blends right back in with the neighboring businesses: an odd collection of offices, restaurants and lumber yard.